YES... another GIVE AWAY here at PBD! 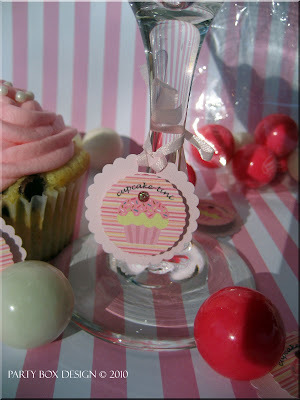 I realize not everyone is a Mommy, so Mommy-Tini Tags won't really work... sooooo how about some Cupcake-Tini Tags!?! Perfect for any fun get together! Enter to win your very own set of 12! TO ENTER: Visit Party Box Design's Website and tell us what products you love most, OR what products you wish we offered! 1. Blog about this Give-Away with links to Party Box Design(blog). 2. Add our button to your sidebar. 3. Follow us. If you already do, thank you! 4. Become a Face Book Fan! Please leave an extra comment for each entry and your E-Mail address. Winner will be chosen by True Random Number Generator. Hope you all had the most lovely weekend! Very cute! And who doesn't love cupcakes!?! I LOVE the Easter Stickers and Cupcake toppers! How did I miss those??? I wish I planned an Egg Hunt this year! Grabbing your Button for my Bloggy-can't believe I've slacked on this, Boo too Me! Love your cupcake stand!!!!! That tutu is so stinkin' cute! I love the signature cocktail tags! Love the signature cocktail tags! I'm a follower and a fan on Facebook! The due date toppers are fabulous!!!! I am a very happy follower!! love the little "thanks for coming" tags! I love this giveaway and so your lovely products! I really like the cupcakes and the signature cocktail tags. Love the cupcake tower and those cupcakes look delicious. I am a FB fan, thanks for the chance to win. I think I would LOVE to use the party confetti for the Curious George themed party I am throwing in May. It would be adorable! I just added your button to my blog. I can't believe I haven't done that before! 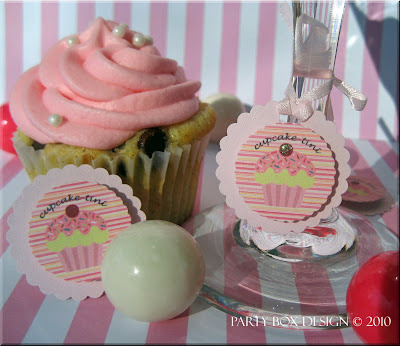 You should make one that says "Number 1 fan of PBD"
I'm a follower and I LOVE the cupcake toppers!